What Programs Are Available To Assist People With Disabilities in Pennsylvania? What state department handles the Medicaid waiver program in Pennsylvania? In Pennsylvania, the Department of Public Welfare administers multiple Medical Assistance/Medicaid waivers. Each waiver has its own unique set of eligibility requirements and services. What programs assist people who have disabilities in Pennsylvania? The following programs assist persons with disabilities in Pennsylvania: The Autism Waiver; Person/Family Directed Support (PFDS) Waiver; Independence Waiver; and Attendant Care Waiver. The Person/Family Directed Support (PFDS) Waiver serves people with intellectual disabilities. The Independence Waiver; and Attendant Care Waivers serve people who have physical disabilities. If a person is determined eligible for more than one HCBS program, the person cannot receive services under two or more such programs at the same time. The person must choose one HCBS program and receive the services provided by it. What is the best number to call to get started? To learn more about programs that assist persons with disabilities call the Department of Public Welfare (DPW) HelpLine at 1-800-692-7462. You can also contact Maximus for enrollment information at 1 877-550-427. Are there income limits to receive waiver services in Pennsylvania? Financial eligibility for waiver programs require that individuals must have countable income below $2,022 per month and countable resources below $8,000 (including savings accounts and investments). How old do you have to be to start receiving waiver services in Pennsylvania? Age requirements vary by program. Person/Family Directed Support (PFDS) Waiver serves individuals who are age 3 and older with an intellectual disability. The Independence Waiver serves individuals who are 18 and over with a physical disability likely to continue indefinitely. The Attendant Care Waiver serves individuals between the ages of 18 and 59 who have a medically determinable physical impairment that is expected to last at least 12 months. The Autism waiver serves individuals who are 21 and older with a diagnosis of Autism Spectrum Disorder. How long is the waiting list in Pennsylvania? You can expect to wait 7 or more years before receiving waiver services in Pennsylvania. The waivers currently require that people in the emergency category are enrolled into a waiver before those in the critical or planning categories. How many people are on the waiting list in Pennsylvania? There are 14,647 people on the Medicaid Waiver waiting list in Pennsylvania. How many people are currently receiving Medicaid waiver services in Pennsylvania? There are a total of 62,620 people receiving waiver services in Pennsylvania. The largest numbers are in the IDD and Aged Waivers. The IDD waiver serves 26,376 people, and the Aged waiver serves 22,762 people. What assistance is available while you wait?Pennsylvania does not offer service or assistance to people waiting for waiver services. Is there priority preference for people who are in crisis? Possibly, but there are already over 10,000 people identified as having either an "Emergency Need" or a "Critical Need" for waiver services. People on the waiting list are grouped based on need. 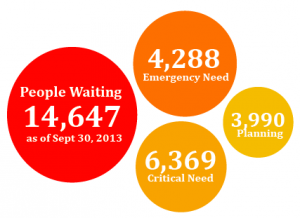 People fall into emergency, critical, or planning status when on the Waiting List. The waiting list uses the Prioritization of Urgency of Need for Services process, known as PUNS, to rank people’s need for enrollment in the waivers. http://www.pawaitinglistcampaign.org/ to learn more about the waiting list. What services does the Medicaid waiver program offer in Pennsylvania? Services offered vary by waiver program. The Person/Family Directed Support (PFDS) Waiver offers the following services: adaptive appliances and equipment; Home and Community Habilitation; personal support services; prevocational services: therapies (PT, OT,Speech, Visual/Mobility, and Behavioral); licensed day habilitation; homemaker/chore services; respite care; supported employment; visiting nurse; transportation; support coordination; home modification; and transitional work services. Does Pennsylvania community group homes? Yes, Community residential options include group homes. Licensed Residential Services include:Community Homes for People with Intellectual Disabilities, Family Living Homes, Child Residential Treatment Facilities, and Community Residential Rehabilitation Services Homes. Does Pennsylvania offer supported living? Yes, People are provided supports in their family home or their own home. Are there still state owned institutions in Pennsylvania? Pennsylvania has five large state facilities housing 1200 Americans. Do waiver providers work for the state in Pennsylvania? No, waiver providers are not state employees. Providers may be Direct Vendors or may function as an Organized Health Care Delivery System (OHCDS). An OHCDS provides goods or services but is not the direct vendor who renders the actual service. About how many waiver providers are there in Pennsylvania? There are over 2,000 Medicaid waiver providers in Pennsylvania. Do you have a choice in providers? Yes, Waiver participants are afforded the right to choose among willing and qualified waiver providers. Call 1-800-692-7462 to learn more about becoming a waiver provider in Pennsylvania. Clelian Heights is a licensed, private, non-profit, educational, residential and vocational facility for children and adults with developmental disabilities.